Pattern winners: Kendra (Aqua Mom) and Big Mama. Brown Paper Packages, my co-conspirator this month, is the creator of this adorable reversible pinafore. I was a pattern tester for her last summer, and she has recently released the pdf pattern in her Etsy shop. One dress = four looks. How cool is that? PDF format, available in sizes 1 to 8. The PDF pattern is printer friendly - it prints to size and there are very few pattern pieces to fuss with. Easy to follow instructions and a great end result. TO WIN A COPY OF THIS PATTERN, simply leave a comment below. I am giving away two copies of the pattern, courtesy of the designer, Brown Paper Packages. I will choose two winners on February 21st via Random.org. If you'd like to purchase the pattern, it is on sale now for $4 in her Etsy shop. This is wonderful. Four different looks with one dress? sign me up please! That is so adorable! I know a little girl who would look so cute in it too! Love this! So many possibilities! Thanks for the chance to win! Super cute--would love to dress my little girl in that! 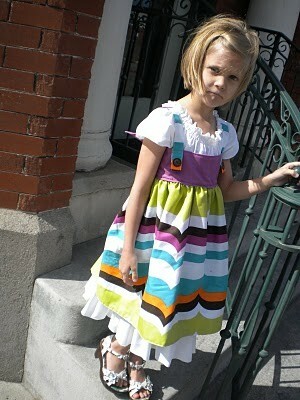 My little girls would look so cute in this dress! I would love to win it! How sweet. What a great idea, 4 looks, on pinefore. Please include me in the giveaway. So adorable! And even if I don't win, $4 is a fantastic price for four looks! Love all the different looks! So Cute!! Very cute! So smart! 4 looks? Amazing! would be so cute on my girls !! What fun! Hope you pick me!! This would be so cute on my little one. So Cute! Everything the dress, Modles, & photography. I have been waiting for it to warm up to bring my lil princess to the park for some pictures & fun! That is so cute. I would love to win, thanks for the giveaway. Sounds fun! My girls would love this. Woowoo! I'd love to win! So super cute! This is so cute. Thanks for the chance to win. This is an amazing pattern. Any little girl would love to wear a pinafore like this. Oh it's SO cute. I would love to be able to make this for my little girl. i love it. thanks for the giveaway! How cute! My granddaughter would look so cute in this. 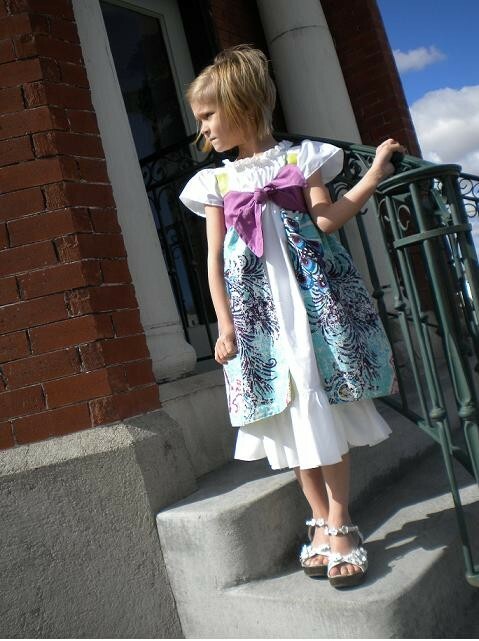 I've got 2 granddaughters that would be so adorable in this dress!!! would loved to win! I love that it can be worn frontwards and backwards. That's adorable! Love this pattern/dress. I would love to win it and am thinking of purchasing it. What a sweet little pinafore! Love your site...I gave it an award! Go to www.imsewcheap.blogspot.com to accept it! So cute! Love the striped one above. Thanks for the giveaway! michela very beatifull blog. would you like to boost canadian style in italy? Lovely dress! I would love to make this for my daughter. What a cute pattern! I hope to win! I'm expecting a baby later this year and I'm trying to get some stuff ready . I love love LOVE the versatility of this pattern! I love that it is reversible. I would love to make this. Wow. How incredibly clever, and cute! I love that it is so versatile! This would look so cute on my little granddaughter! This is too cute! My daughter would love it! Thanks for the great giveaway! So cute and such a great idea. LOVE THIS! My daughter would be so adorable in this! Great ideas!